The Atlas V rocket launched with twin Radiation Belt Storm Probes sent to explore the Van Allen Belts that surround Earth. Astrophotographer Mike Killian took this photo from Cape Canaveral Air Force Station in Florida Aug. 24, 2012. This spectacular image was taken in the early morning hours as the Atlas 5 rocket shot off to explore Earth's Van Allen radiation belts. 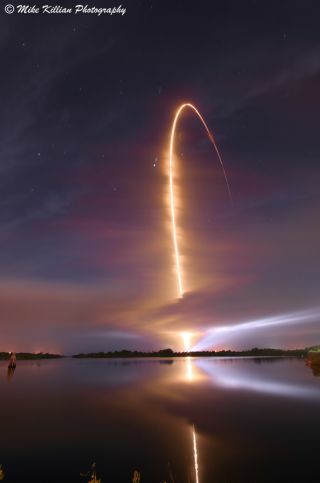 Astrophotographer Mike Killian took this stunning photo from Cape Canaveral Air Force Station in Florida Aug. 24, 2012. The Atlas 5 rocket took off with twin Radiation Belt Storm Probes (RBSP) sent to explore the Van Allen Belts that surround Earth. The Van Allen Belts are two giant rings of charged particles which have a considerable amount of radiation. The probes, which have now split apart, are exploring the harsh conditions of the belts and gathering data on space weather systems. Killian's launch image for the radiation probes is a composite of two photos. The first focused on the dramatic contrast between the launch pad, clouds and sky while the second captured a three-minute exposure of the rocket’s burst into orbit. Follow SPACE.com for the latest in space scienceand exploration news on Twitter @Spacedotcom and on Facebook.